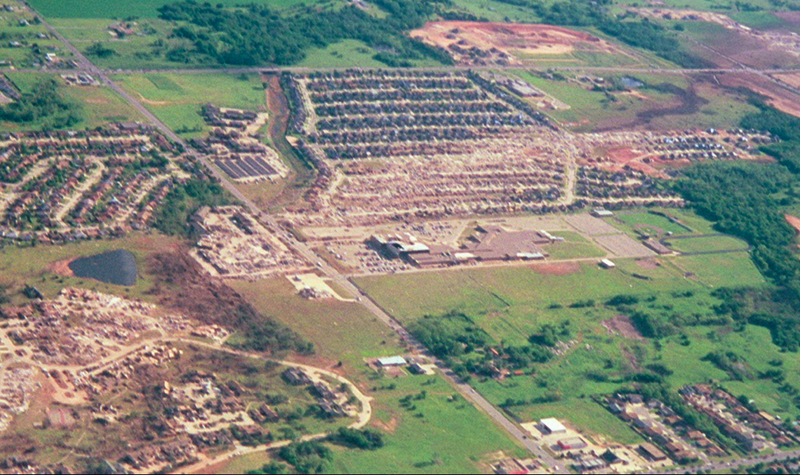 Aerial view of damage left behind by the Bridge Creek tornado. The tornado’s proximity to the I-44 gave the Doppler On Wheels an excellent opportunity to analyze the storm at close range for an extended period of time. □ On May 3rd, 1999, all the atmospheric ingredients needed for the creation of large, long-tracked tornadoes came together over the Great Plains. A dry line atop the Oklahoma and Texas Panhandles separated a mass of warm, humid air from dry, cool air slowly encroaching from the west. Weather balloons released across Tornado Alley rose into the air in erratic zigzags, and indication of rapidly shifting winds at different altitudes. The atmosphere was unstable, and by late morning the National Weather Service had upgraded the severe weather risk from slight to moderate. Around 4pm, weather satellites captured a series of supercell thunderstorms exploding out of the afternoon sky. At 6:20pm, a large funnel descended from the sky near Amber, Oklahoma. The tornado, later dubbed “A9” on survey maps, rapidly intensified as it thundered northeast through Grady County. Within minutes of touchdown, the storm expanded into a massive wedge more than a half mile wide. Storm chasers captured the tornado as it tore past the Chickasha Municipal Airport and entered an unpopulated area to the northeast. The mesocyclone that spawned the tornado was exceptionally violent. Low hanging clouds or “skud” swirled around the massive tornado at terrific speeds as large satellite vortices rotated around the main funnel, causing additional damage. Local news stations in Oklahoma City quickly focused their attention on the Grady County storm, and regular programming was interrupted by live broadcasts of the approaching tornado. The tornado struck little for many miles before taking aim on the small, unincorporated town of Bridge Creek. By the time the tornado reached the town’s first cul-de-sacs it had expanded to a mile in width. View of F5 damage on County Street 2977 in Bridge Creek. The highest concentration of fatalities throughout the tornado’s path occurred in this area, and 75% of them were related to mobile homes. The tornado was at peak intensity as it approached the I-44 Interchange in Bridge Creek. Unfortunately, many of the households in the area were mobile homes with no underground storm shelters. Some residents sought protection in irrigation ditches and culverts beneath roads, though many were seriously injured by the blizzard of flying debris. One young couple was caught outside while running a short distance to their neighbor’s storm cave (Pam, Brown, Kruger et al., 2001). Their bodies were found wrapped in debris more than 200 yards from their destroyed home. Damage in the Bridge Creek area was among the most intense ever surveyed. Frame homes were swept completely away and mobile homes in the direct path of the storm disappeared without a trace. Aerial imagery around the I-44 Interchange showed a 200-yard wide core of extreme damage in which vegetation was ripped from the ground and trees were stripped of all bark and branches. Surveyors also documented vehicles thrown up to one mile. In total, 12 people were killed in Bridge Creek. The fatality to injury ratio was seven times higher in Grady County than in the Oklahoma City suburbs, a testament to the storm’s incredible ferocity in the area. 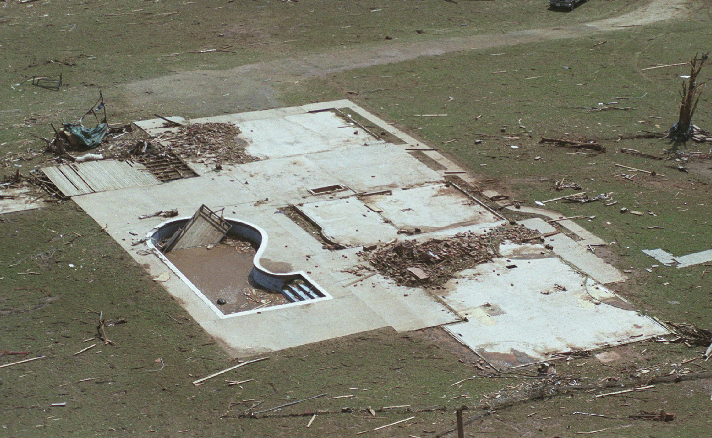 The remains of a frame home in Bridge Creek (the DOC Service Assessment stated this home was in Cleveland County near Moore). Three of the 12 fatalities in Grady County were in frame homes, many of which were swept cleanly away. The vegetation scouring was among the most intense ever surveyed. 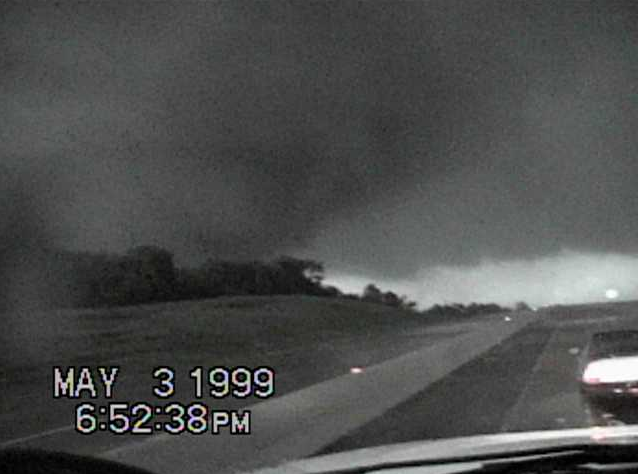 The Bridge Creek tornado traveled parallel to the I-44 for much of its life. Had the tornado travelled a half mile farther to the south, it would have spent over 20 miles directly over the freeway and likely killed dozens of motorists. Surprisingly, none of the tornado’s fatalities occurred in vehicles. There were four fatalities, however, in which people attempting to flee were killed while running to their vehicles. Additionally, there were two well-documented deaths beneath freeway overpasses. A third overpass death often attributed to the tornado was actually caused by a separate storm north of Oklahoma City near the town of Mulhall. It is remarkable that only two women were killed seeking shelter beneath overpasses. Both locations were struck by the tornado after it had reached peak intensity, likely allowing more than two dozen others to escape with their lives – though many of the survivors were left with serious injuries. 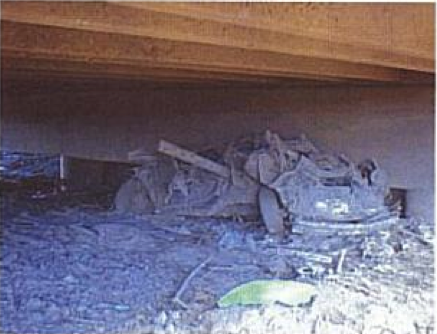 In the image above, a mangled vehicle was found beneath an (unoccupied) overpass after being blown more than half a mile. The path of the tornado along the I-44 gave the Doppler On Wheels (DOW) an excellent opportunity to stay within close proximity to the tornado for a long period of time. As a result, the DOW was able to thoroughly analyze the storm throughout its mature stage. It is a common misconception that mobile doppler radar “measures” tornadic winds and provides researchers with a single numerical value. Instead, mobile radar analyzes the movement of condensation and debris and calculates a statistical range in which the particle velocity can be estimated. As the Bridge Creek tornado passed the I-4 interchange, the DOW calculated a velocity that likely fell between 281 and 321mph. The figure, often quoted as 301mph +-20mph, remains the highest radar velocity ever recorded. This is by no means, however, evidence to support that the Bridge Creek tornado was “the strongest tornado ever recorded.” Far less than 1% of all violent tornadoes have been tracked by mobile radar, and of the tornadoes that have been analyzed, only a fraction of their total path lengths were recorded. 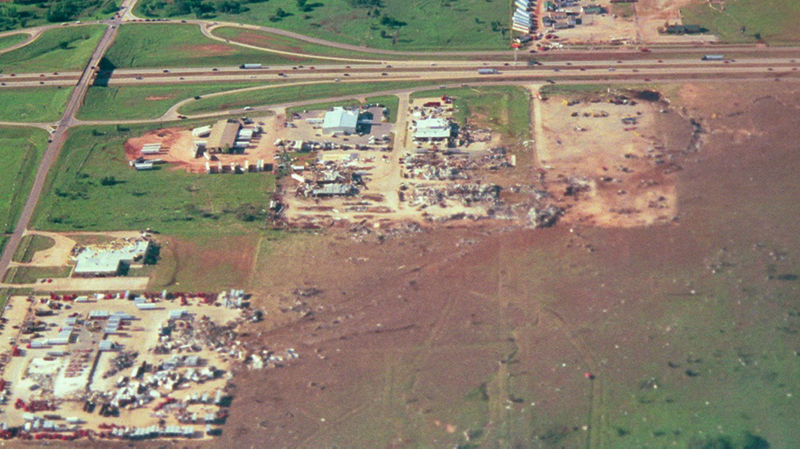 The Bridge Creek tornado’s unique path adjacent to a freeway gave researchers a rare opportunity, and it is not surprising that the record velocity was calculated given the near perfect circumstances. Ground scouring indicates that the tornado remained intense as it entered McClain County. The path width narrowed slightly, and the tornado’s appearance changed into a ‘stovepipe’ formation with a wide debris cloud at its base. After remaining parallel to the I-44 for more than 40 minutes, the tornado reached a bend in the freeway and crossed over it, leading to McClain County’s only fatality. A woman who had taken shelter under an overpass with her son was swept away and killed while others who had taken shelter in the same location were injured by flying debris and found plastered in red dirt. Three views of the F5 tornado. The first two images show the tornado as it entered Cleveland County. 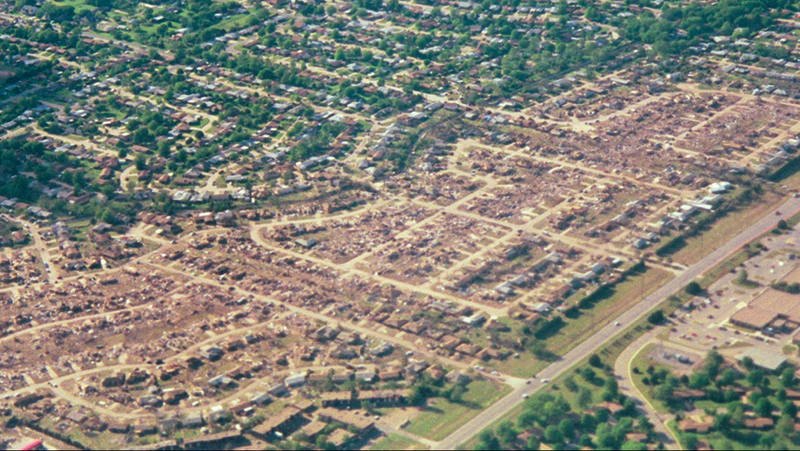 While the tornado often appeared as a massive wedge, the width of the primary damage path through Moore was generally less than 200 yards wide. 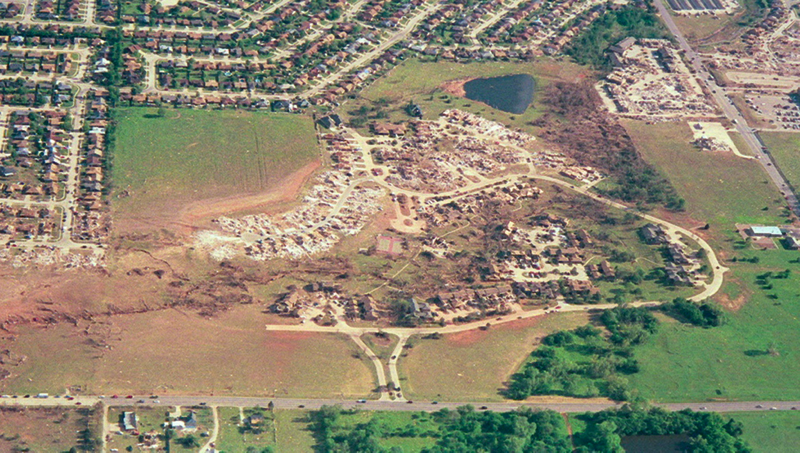 At right, the appearance of the tornado after it had entered Moore and filled with debris. The city of Moore was nearly motionless as the tornado entered Cleveland County. Sirens had been sounding for nearly an hour, and on-air meteorologists had advised viewers in the strongest language ever broadcast to seek shelter or “you will not survive this storm.” Entire rows of tightly packed homes were obliterated as the tornado entered town from the southwest, filling the sky with debris. 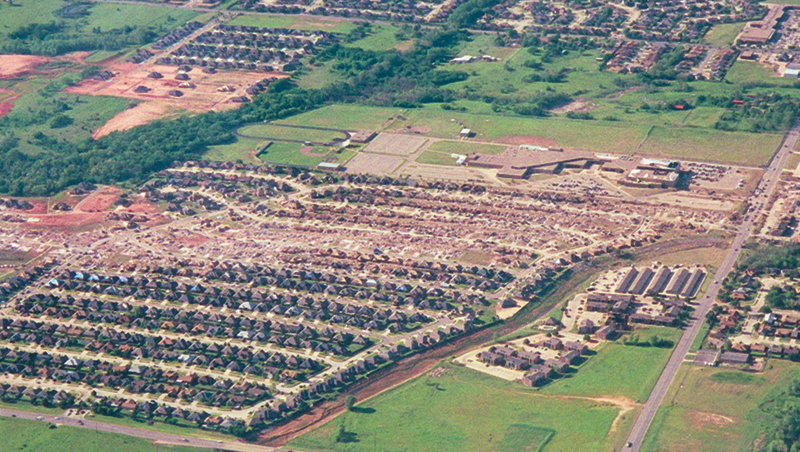 One of the first housing subdivisions directly impacted by the tornado was Eastlake Estates, located to the south of Westmore High School. While the tornado engulfed a wide area, the extreme damage was confined to a streak 100 yards wide in the center of the damage swath. National Weather Service employees photographed the row of homes that were swept away in F5 fashion in Eastlake Estates. At right, completely debarked trees in a field to the west of Moore. Eleven people were killed in Moore, and a further 12 were killed in Oklahoma County, specifically in Del City and Midwest City. A detailed morbidity report concluded that a third of the documented victims were killed in “recommended places”, meaning in an interior room in a frame home. Excluding the deaths in Grady and McClain County, it is probable that most of the victims in the Oklahoma City area had taken appropriate shelter. 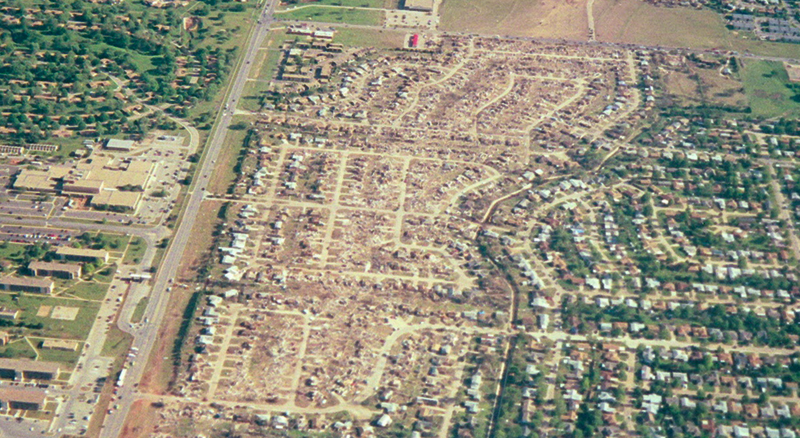 The intensity of the tornado made survival, even in some well-built homes, difficult. At least two of the fatalities in Moore occurred when vehicles were hurled atop people huddled in their homes. The tornado was the deadliest in the United States during the 1990’s and remained the single most damaging tornado in history until 2011. Even so, the death toll of 36 people was surprisingly low. Excellent warning, live television broadcasts, good visibility and the tornado’s fairly slow forward speed reduced the number of fatalities. Had the tornado formed two hours later, after dark, the death toll could have easily been twice as high. 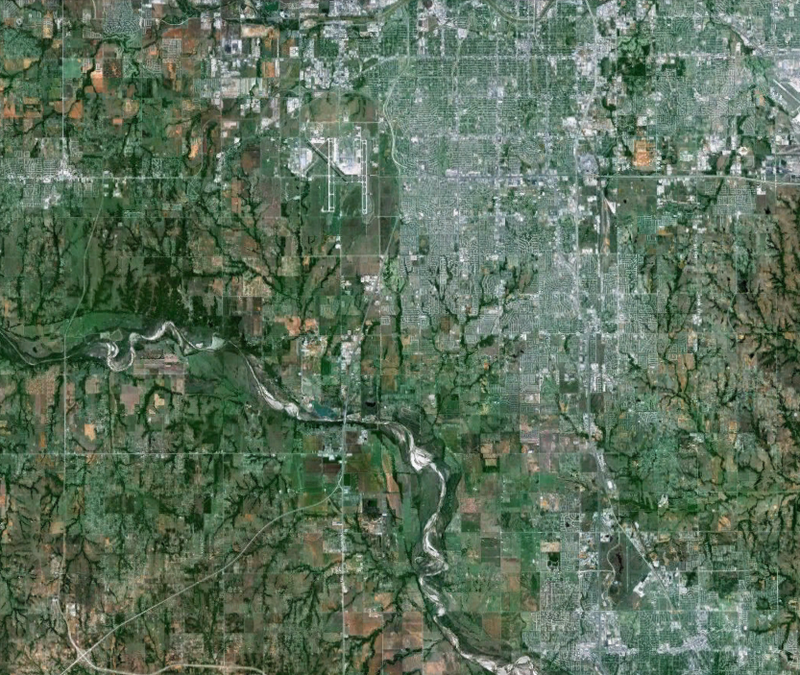 The path of the F5 tornado is still visible years later in satellite images. 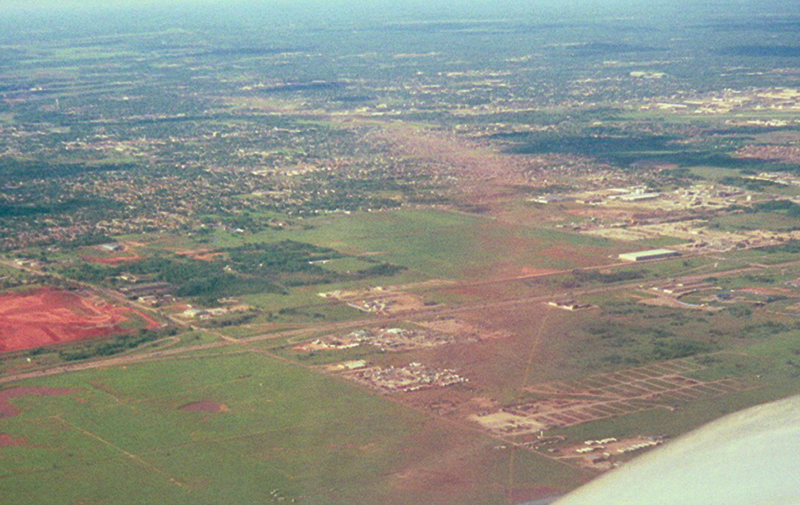 A trail of deforestation can be seen at bottom left near Bridge Creek, and the northerly turn the tornado made in Del City is visible at top right. 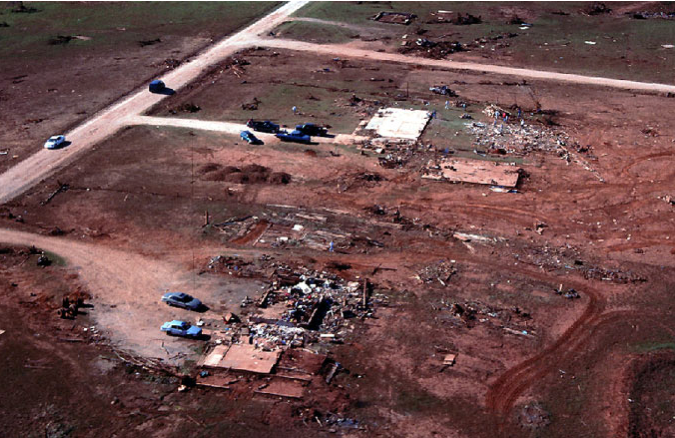 Some falsely believed that the Bridge Creek tornado was ‘proof’ that no single tornado could ever again cause over 100 fatalities. This assumption was shown to be terribly wrong in 2011 when an EF5 tornado killed 158 people in Joplin, Missouri. While the Bridge Creek tornado’s death toll was testament to improved forecasting and technology, the storm was, in a sense, perfect from a forecasting perspective. Tornadoes that intensify rapidly near populated areas and tornadoes obscured by precipitation will continue to pose a major threat to cities across the county. A tornado causing over 1,000 fatalities in United States is not just a possibility but, given enough time, a meteorological certainty. *Bob Webster’s complete aerial photo gallery of tornado damage in Moore and Oklahoma County can be found here. Used with permission. In that photo of the frame house in Bridge Creek, I think I see a trailer in the basement. Did any fatalities occur at that home? And was it due to the trailer or not? I think what you’re seeing is a pool and not a basement, unless you mean a different picture. After reviewing the aerial survey I was still unable to pinpoint exactly which house that was. The chances of surviving in a house swept so cleanly away are not very good, but most of the people in the path of the storm had ample time to drive out of the tornado’s path/find a nearby storm cellar. Probably a pool, then…but does it look like a trailer in the pool to you, or not? I was referring to the fifth photo on the page, if that helps to clarify what I said. I’ve always been curious to know this but in the strongest of tornadoes, could it actually be possible for them to destroy or at least damage those concrete highway overpasses? I’ve heard that the strongest tornadoes can severely destroy even reinforced steel concrete structues. I’ve heard that above-ground tornado proof shelters or monolithic dome houses are able to withstand 300 mph winds but I’ve always been skeptical about that. What is your opinion on those shelters? I feel that an EF5 has the ability to destroy even extremely strong structures such as those if they take a direct hit. A monolithic dome house was impacted almost directly by the 2011 Chickasha tornado and was severely damaged (made into swiss cheese by flying debris) but not leveled. The tornado was likely at EF5 intensity at the time, but the home was just outside the swath of probable EF5 damage. I believe, as do many other storm chasers, that some violent tornadoes have instantaneous gusts in excess of 300mph at the surface. I imagine most above ground shelters would survive a violent tornado if they were steel reinforced, but the rare breed of tornado (Jarrell, Smithville, El Reno) capable of deeply scouring the ground and hurling massive objects might breech even a shelter designed to withstand 300mph+ winds. Would you happen to have a picture of the dome? did EF5 winds directly impact the overpasses that people took shelter under or were the winds found to be lower, maybe EF3 range or so? Also what do u think sustained winds were in this tornado? Grass scouring indicates that the tornado was still intense, probably at F4/high-end F4 intensity, when it directly impacted the first overpass. The tornado had weakened from its intensity maxima farther south. I imagine peak surface winds in the vicinity of Bridge Creek were near 300mph. I was curious because from photos it didn’t look like much damage occurred to the overpass that was directly hit. Why would that be? I know they’re sturdy structures but you’d think that at least some damage would occur to them in such high winds since EF5s can severely damage even the strongest of structures. I don’t think the majority of EF5’s would be able to seriously damage a concrete bridge. They are generally very well-constructed, steel-reinforced and aerodynamic in shape. If an EF5 had a powerful vertical component and was unusually intense, then possibly it could cause serious damage to a bridge. One tornado given an EF3 rating on 4/27/11 nearly destroyed a concrete bridge in Mississippi. If you look at the comments under my article “Incredible Aerial Damage Pictures from the EF5 Smithville Tornado” you’ll see a link posted by another reader with pictures and descriptions of it. thank you got it. do you think something like the jarrell tornado would’ve even taken out overpasses due to its incredibly violent winds? 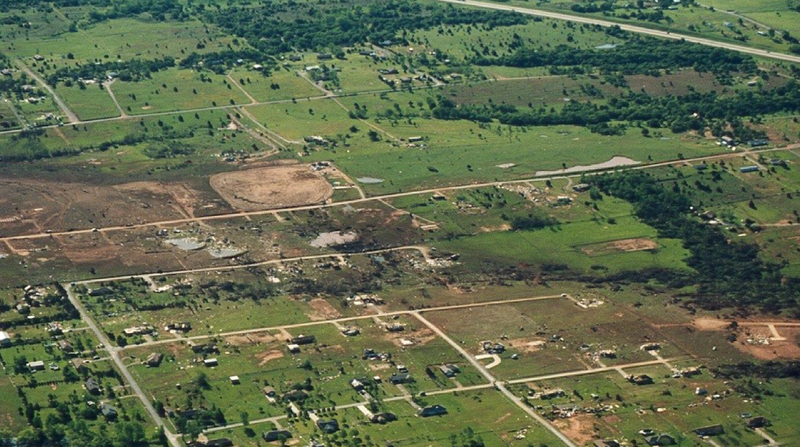 The Moore/Bridge Creek/OKC tornado on May 3, 1999 and the Westminster, Texas tornado on May 9, 2006 have ground scouring that appears eerily similar. The Westminster tornado I don’t believe was as nearly violent as the 1999 OKC but vegetation scouring appears to be very similar. 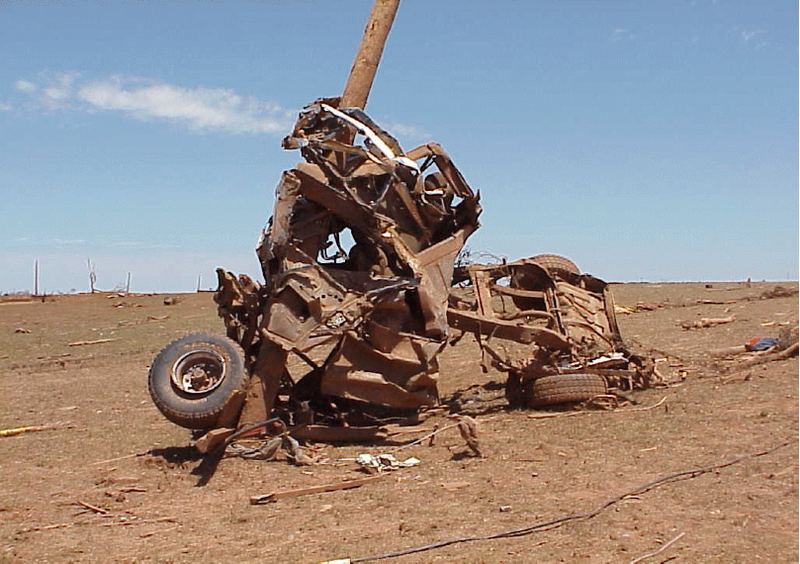 The Westminster tornado vegetation scouring was a little bit more narrow than the 1999 OKC tornado. Do you see the vegetation scouring as similar for both tornadoes? Why are some tree trunks still left standing after a powerful tornado hits them? Shouldn’t they be fully uprooted in such intense winds? 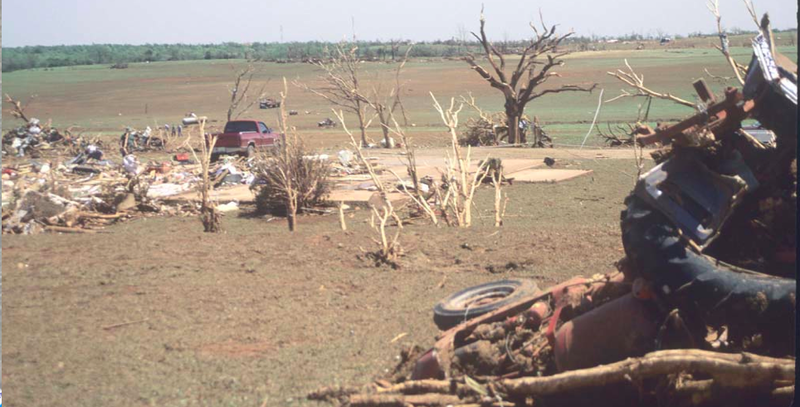 Most trees are uprooted in EF5 tornadoes, particularly if the winds build slowly. When the winds accelerate quickly, however, some trees are quickly stripped bare of leaves and branches and become rather aerodynamic against the forces of the wind. if a certain structure or object is aerodynamic, then does that automatically mean that a tornado cannot have any or much of an effect on it due to its aerodynamic nature? No, it does not. Anything above ground will still experience extreme forces due to the intensity of the winds. Additionally, flying debris would continue to exert violent impact forces regardless of the object’s shape and strength. No question about it the 1999 Bridge Creek/Moore tornado remains one of the strongest ever the videos and damage are mind-boggling. I agree based on the damage & scouring and also the videos taken of the tornado as it dragged through Bridge Creek the surface winds had to be near 300mph so I think the DOW measurement is very accurate. It was a giant wedge for most of it’s trek along I-44 (H.E. 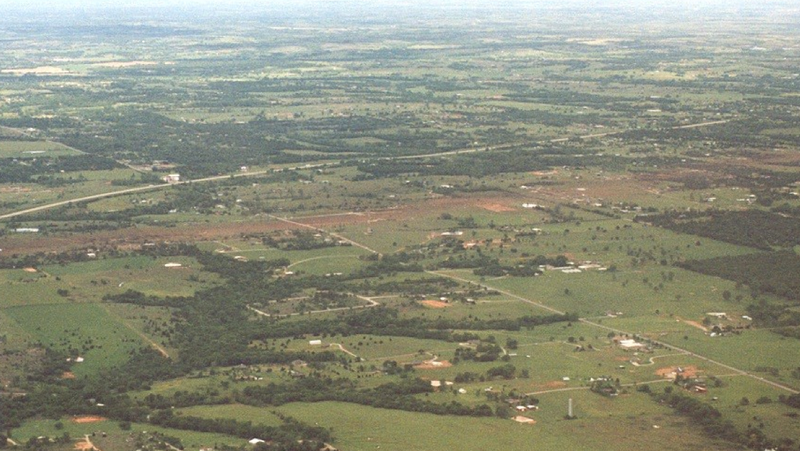 Bailey Turnpike) towards OKC, peaking in width right about where Bridge Creek is which as the crow flies is basically parallel to the toll-booth on I-44. The flickering lights of the tollbooth are visible in some videos as well as powerflashes from the tornado as it decimated Bridge Creek. Based on what I have seen & read, the DOW creeped along slightly behind the tornado on I-44 and the ~301-318mph measurement was taken pretty much right at the tollbooth. The tornado was peaking then. It then cycled down just a bit, still an F5, as it moved along towards OKC, narrowed somewhat but then wedged out again as it hit Moore. I think when it reached Moore it might have flirted with 300mpg again briefly but that’s just a guess on my part. The radar hook echos taken when it was in/near Bridge Creek clearly show a textbook crystal clear hook echo also, better defined than when it entered Moore a bit later. In this amazing video I found on youtube you can clearly see the tornado as it is in it’s peak phase, towards the end the narrator mentions the toll booth and somewhere mid-way to the end of the video is where the DOW recorded the measurement of ~301-318 mph. All this being said, of course it can never be proven, but I still think the Hackleburg/Phil Campbell tornado probably was more powerful than the 99 & ’13 Moore tornadoes. Just a guess though. If the time stamp on that video is correct, then the peak DOW velocity was taken a few minutes after the end of the clip around 6:50 -6:55pm. The peak velocity was recored when the tornado was directly over Bridge Creek. I have been curious about the house where nothing was left but the water heater. Would that be considered F4 damage since the water heater remained in place? You mean the image above from Eastlake Estates? I can’t tell if that water heater is from that house or perhaps another one, but that damage would likely have recieved an F5 rating if the home was determined to have been well construsted. isn’t the biggest anymore. Now the record belongs to the El Reno OK tornado. EF-5 of 295 mph and was 2.6 miles wide. Oh, and also had four sub vortices around the tornado and they were exceeds about 295 as well but we large EF-2 tornados.